Because these are just minor performance improvements over the existing RX 480 and RX 470 cards, these newer cards replace the RX 400 cards in AMD’s product stack, but they aren’t intended as upgrades for existing owners. Instead they’re meant to tempt owners of cards like the R9 280 and R9 380 series who didn’t already upgrade to Polaris. For those owners who did hold off, their reward is a slightly more powerful upgrade option in 2017 than they would have gotten in 2016. Otherwise for AMD, this is a chance to partially clean the slate for 2017. The RX 500 series’ job isn’t to radically alter the competitive landscape – that’s Vega’s job – but rather it’s to push out a bit more performance and help close the gap in the midrange market with NVIDIA, while giving partners something new for 2017. NVIDIA has seemingly already made their move for 2017 in the midrange market with the optional 9Gbps factory overclocked GTX 1060 SKUs, so AMD would appear to be setting the stage for what should be much the rest of the year. 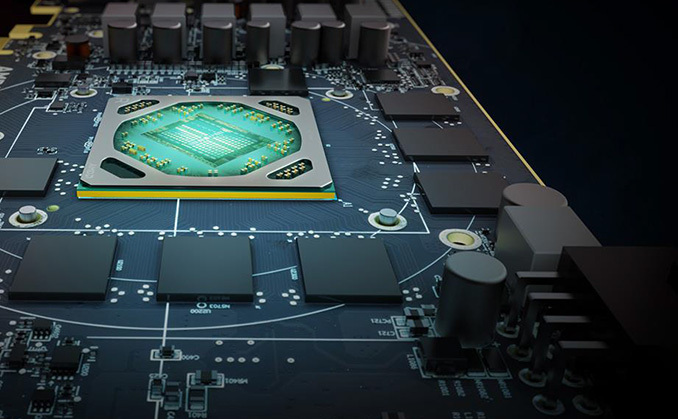 When the dust settled from the launch of AMD’s Polaris and NVIDIA’s Pascal architectures in 2016, NVIDIA generally prevailed, so this is AMD’s chance to rethink their gameplan and continue trying to grab market share from NVIDIA. At the high end is AMD’s new midrange contender, the Radeon RX 580. Like the RX 480 before it, this is a fully enabled Polaris 10 GPU. Taking advantage of their manufacturing gains, AMD is bumping up the boost clock by 6%, from 1266MHz to 1340MHz. Meanwhile the base clock – which has proven somewhat arbitrary on RX 480 since it rarely throttles anywhere near that much – is increasing by 12%, from 1120MHz to 1257MHz. As we’ll see further in this review, expect the performance gains to closely mirror the boost clock changes. Meanwhile the memory clock is not changing for the 8GB cards. AMD is holding fast at 8Gbps GDDR5 on a 256-bit memory bus. 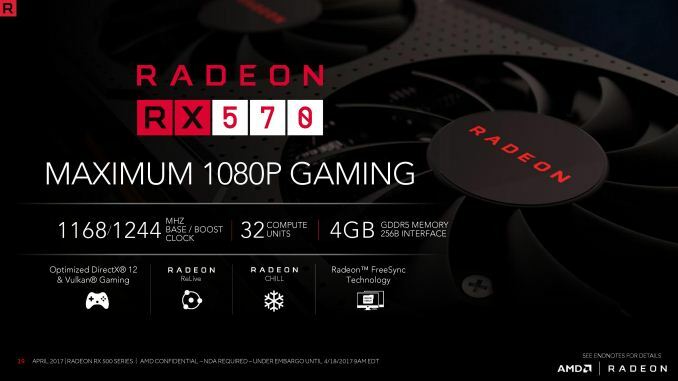 It should also be noted though that while the default configuration of the RX 580 is 8GB, like the RX 480, some 4GB cards are also expected to be produced. Joining the RX 580 in today’s launch is the Radeon RX 570. Like its more powerful sibling, this is an enhanced version of its RX 400 series predecessor, the RX 470. We’re looking at the same cut-down Polaris 10 GPU with 32 of 36 CUs enabled, but again clockspeeds are increased. RX 570 goes from 1206Mhz to 1244MHz on the boost clock, a 3% gain, while the base clock is increased from 926MHz to 1168MHz, a gain of 26%. One thing RX 570 gets that RX 580 does not is a memory speed bump. On RX 470 AMD set the SKU standard at the somewhat odd 6.6Gbps; for RX 570, this is now a full 7Gbps, for a 6% increase in memory bandwidth. Polaris 10 in general likes memory bandwidth, so as you can see in our companion RX 570 review, this works out well for the RX 570. The standard memory configuration here will be for 4GB of VRAM, however AMD has mentioned that we should expect to see some 8GB cards as well, though none of these are on the launch list they’ve provided. Otherwise the big change here is on power consumption. RX 580 is a 185W card, while RX 570 starts at 150W. This is a 30-35W increase in TBPs over the RX 400 series, and given the expected prevalence of factory overclocked cards, the TBP of the average retail SKU is probably a bit higher still. Manufacturing improvements in the last year have allowed Polaris to clock higher and/or reduce power consumption slightly at a given clockspeed, however in AMD’s case they’ve opted to spend all of these gains (and then-some) on clockspeed improvements, hence the TBPs we’re seeing today. While this is a natural consequence of cranking up Polaris’s clockspeeds, what’s not really being said by AMD is why. And while not putting word’s in AMD’s mouth, from an outside perspective it’s pretty easy to see what’s going on. Polaris greatly improved AMD’s energy efficiency, but then Pascal did much the same for NVIDIA. As a result while the RX 400 series cards delivered good performance, they weren’t very competitive with NVIDIA’s GTX 10 series in the realm of power consumption. Consequently AMD’s no longer trying to compete on power efficiency on the Polaris 10 series: they are going right to the bend in the power/performance curve (and quite possibly past it) to deliver the best performance per dollar that they can. Competing on price is ultimately how they can best grab more of NVIDIA’s market share. Moving on, since these new SKUs are just higher clocked Polaris 10 configurations, this means that for retail cards partners are hitting the ground running with custom cards. In fact AMD isn’t even shipping a reference design. The cards we’ve been sampled for today and the cards you’ll see on retailer/e-tailer shelves today are all customized in some form or another. 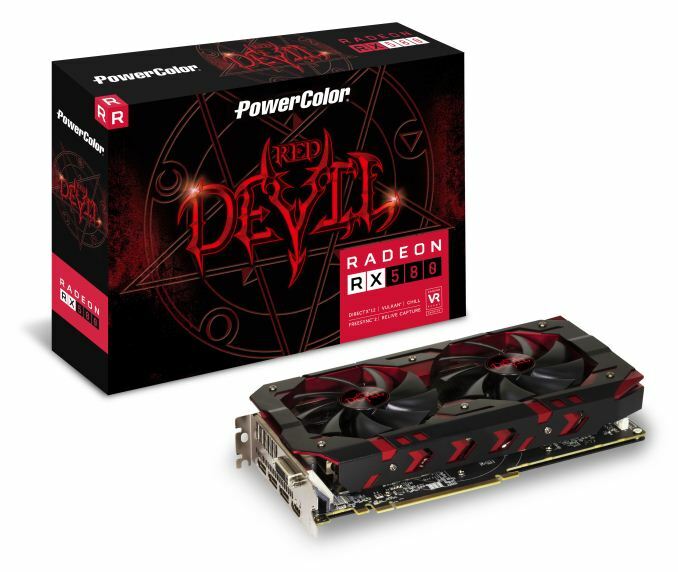 For many board partners, this means they can just take their existing factory overclocked RX 480 cards – which were built for higher TBP operation in the first place – and use them as the basis for their RX 580 and RX 570 cards. Meanwhile other vendors are pushing out new custom designs to handle the new TBPs and to balance board costs with AMD’s prices. Both the RX 580 and RX 570 are launching at $10 below their RX 400 series counterparts’ launch prices from last summer. 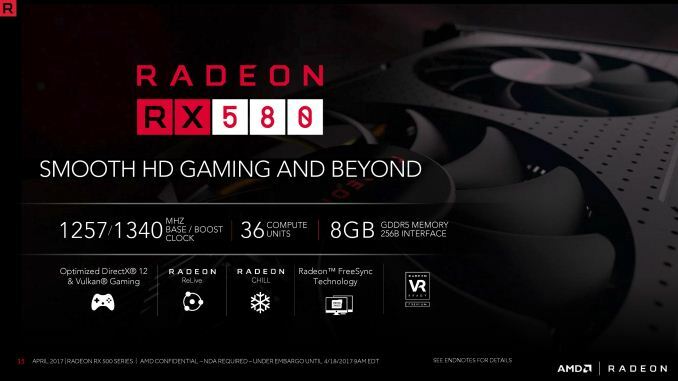 This puts the 8GB RX 580 at $229 and the RX 570 at $169. The odd man out is the RX 580 4GB, which is launching at the same $199 price as the RX 480 4GB. 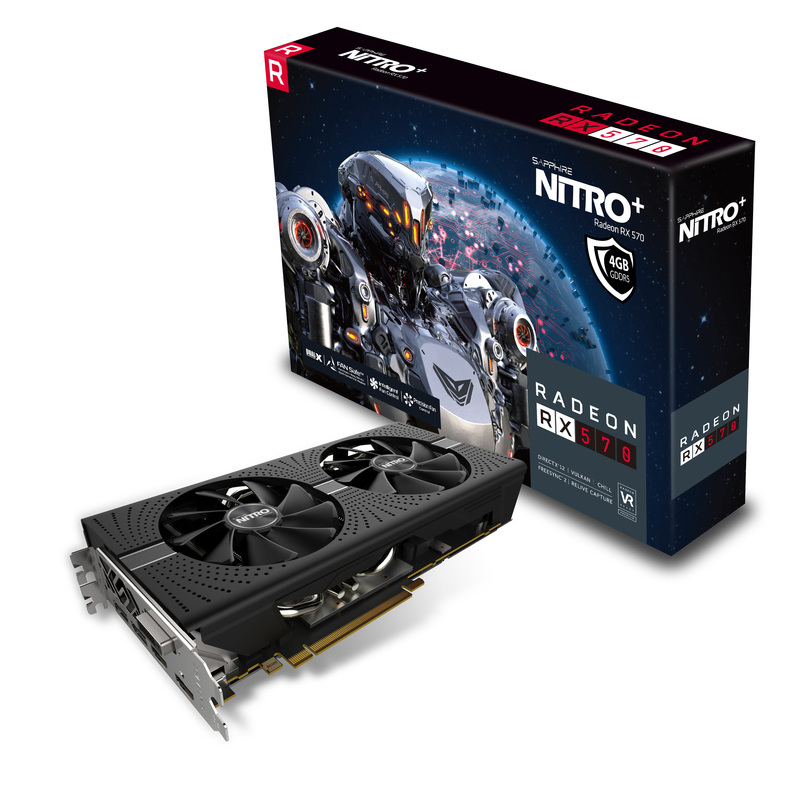 This keeps AMD spot-on the $199 sweet spot, while perhaps more importantly it does a better job of differentiating the card from the next card down, the $169 RX 570. The smaller $20 price gap between the 4GB RX 480 and RX 470 meant that the cards didn’t always stand apart in a useful manner, especially hurting the RX 470. The competition for these new cards, like the RX 480/470 before them, are NVIDIA’s GeForce GTX 1060 series. The RX 580 goes squarely up against the GTX 1060 6GB, while the RX 570 is very close in price to the GTX 1060 3GB. NVIDIA card prices have come down in recent weeks – when I took inventory last month, $229 GTX 1060s were not nearly as common as they are right now – so it would appear that NVIDIA and its partners have trimmed prices a bit in anticipation of the RX 580 and RX 570. AMD can’t compete with NVIDIA on power efficiency here, but if performance improves enough, they can certainly compete on performance-per-dollar. Meanwhile NVIDIA’s latest bundle is ending today, so we’re looking at a straightforward match-up in terms of pricing/value has been extended into next week rather than ending today, so NVIDIA is throwing in a bit extra to try to tilt the value proposition in their favor. Finally, AMD’s partners and retailers are in the process of unloading their existing RX 480 and RX 470 cards. As a result these cards are going for a relatively good deal, but like past inventory clean-outs, this won’t last. However I will be curious to see where the dust settles here in a month or so when the clean-out is done; if AMD’s prices on the RX 500 series hold steady, then it would mean that their price/performance ratio will not have drifted by too much in the last 10 months since the RX 400 launch. Good job Anandtech! Didn't expect it so quickly. That doesn't mean a review was guaranteed. Anandtech, while putting out phenomenal reviews, occasionally delivered them later than launch day.